Mate is excited to announce the expansion of its press brake tooling line with the introduction of American Precision Style press brake tooling featuring the all new, groundbreaking Maglock™ Magnetic Safety System. Introduced at Fabtech 2017 in Chicago, Mate American Precision Style press brake tooling is standard with an industry first from Mate: the patent-pending Maglock™ magnetic safety system. Called brilliant by industry experts, Maglock uses rare earth magnets to attach and seat the punch to the holder with no separation between the surfaces. The magnets are proportionally added along the punch shoulder so that the “up force” of the magnet is localized and directed at the contact surface of the punch holder. Designed with a .500-inch tang, the reversible/symmetrical design enables the punch to be installed facing forward or backward, and makes Mate American Precision Style punches ideal for front loading tooling into the press. 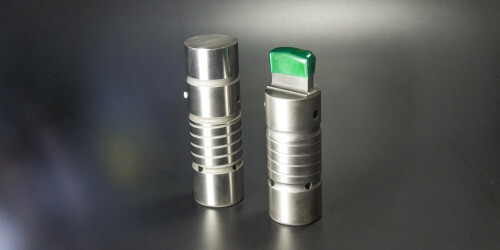 Mate punches and dies with a standard profile all have a uniform height, which is important for operator safety when used with laser or optical safety systems. Mate press brake tooling is induction hardened to ensure wear resistance. Critical working surfaces are precision ground to make high quality, predictability and repeatability possible. Another industry first of Mate’s American Precision Style system is the “buy-by-the-inch” pricing system that lets you buy the length of the tooling that you need; just specify and buy the tooling length required by the part design. To learn more about American Precision Style press brake tooling with Maglock, click here. To learn more about Mate’s American Precision Style system with Maglock can help your operations, contact your Mate Sales Engineer.